The week of the election, starting late during the night of November 8th itself, we saw a shift in sign of three planets — Mars from Capricorn to Aquarius, Venus from Sagittarius to Capricorn and Mercury from Scorpio to Sagittarius. Especially with the Mars transit, which occurred just around the time the election was called for Trump, we are being shown that our inner worlds have been thrown into revolution. Mars in Capricorn represents a martial maverick (or two) rising through the ranks of the old order, but the shift to Aquarius indicates some kind of major upset, an outsider taking the mantle of power away from the establishment. 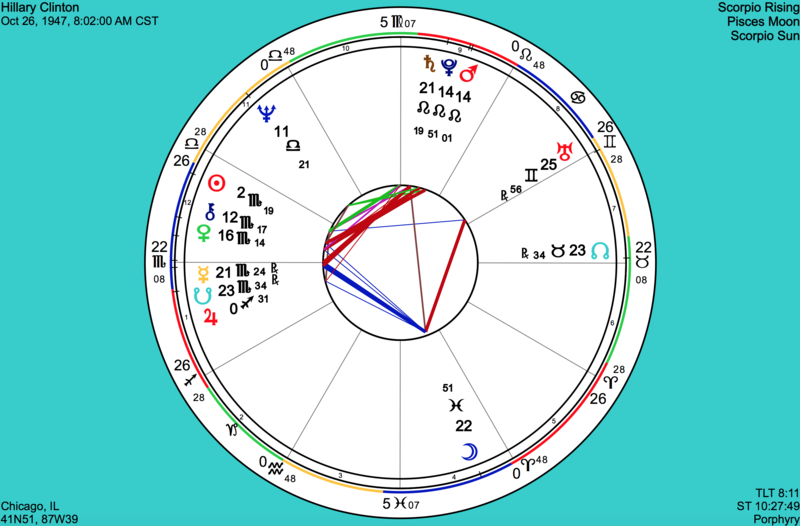 Trump is just such an outsider, given that his Gemini Sun is conjunct Uranus (ruler of Aquarius), suggesting that he is an unpredictable force and interloper into established systems. This fact is propped up by his 2nd House Jupiter, which trines his Sun/Uranus conjunction. 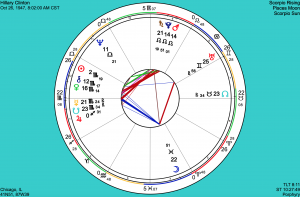 2nd House is material wealth, Jupiter expands the house it's located in (thus, he easily generates lots of money), and his inflated sense of self security empowers (trine) his Sun/Uranus rebellious nature. 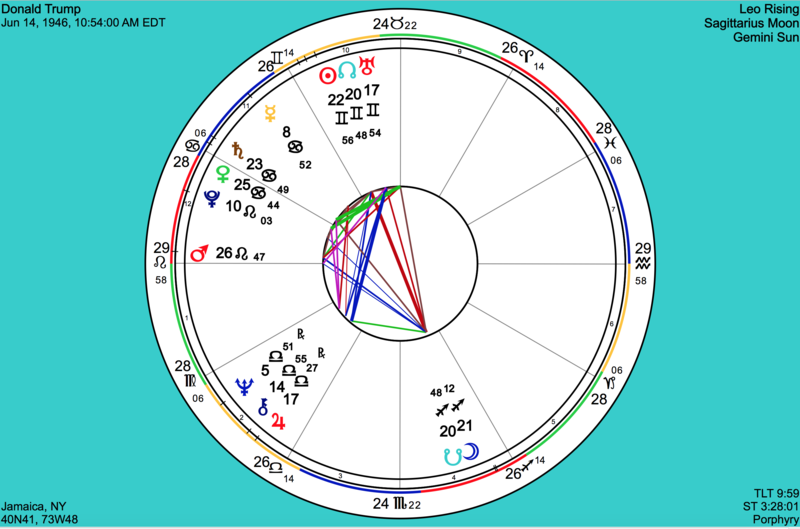 Jupiter/Sun trines are often linked with delusions of grandeur, though in Trump's case he's so good at winning (Leo Mars on his Ascendant) that he easily keeps the belief of his specialness alive. 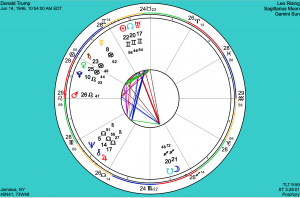 Speaking of Jupiter, that planet has returned to the point where it is in Trump's chart, meaning that at the time of the election Trump was in a Jupiter Return. We all have one every 12 years, and it marks a time of expansion relative to where Jupiter is in our charts, and it often is linked with a marked rise in status. This is powerfully supported for Trump by a sextile to transiting Saturn, which says that Trump's "base" is pulling for him, and that society in general is giving him a special boost yxrjokz. Marking his belief in his own special destiny, Trump was born just a couple hours shy of a lunar eclipse. 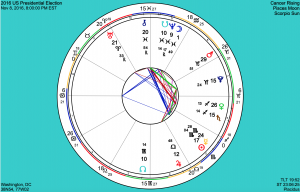 Some astrologers were pointing to the lunar eclipse last September as marking the start of Trump's downfall, given that it made a rather nasty grand cross pattern with Trump's natal lunar eclipse. But given the above transits and Trump's natal signatures of knowing how to win against all odds, it's clearly the case that those factors trumped (sorry) any difficulty linked with the eclipse. Granted, the eclipse did coincide with the video of Trump talking trash about women, which took him down a peg or two, but Jupiter and Saturn helped him get right back up. An important astrological change Trump is going through that was used in part to defend a prediction of loss for him is the recent shift of his progressed Sun from Leo to Virgo. His progressed Sun entered Leo in 1987, about the time his book, Art of the Deal, was published (a book he didn't write but got all the credit for — dark side of Leo). This began a 30 year trend of Trump being elevated into the spotlight, able to do as he pleased and get all the attention he wanted. He was the child at play in the world, or the lion roaring over his pride, never held to account for himself. But with the shift to Virgo, he now is facing a new phase of life — he must do actual work, he must humble his pride in service to something greater than himself. I am not sure that Trump is currently feeling completely happy about being elected president. Probably a part of him is still clinging to his Leo ways, not wanting to let go of living a life of relative reckless abandon, as he now must lay in the bed he has made. He must figure out how to be president. Humility is not his strong suit, and despite the glamorous image of being top executive dog in this country, it's a hell of a lot of work and he may be wondering — or soon be wondering, once his Jupiter Return ends — if he's really actually up to it. For Clinton, there's a clear story of frustration against the entrenched patriarchal system being told in her natal map. 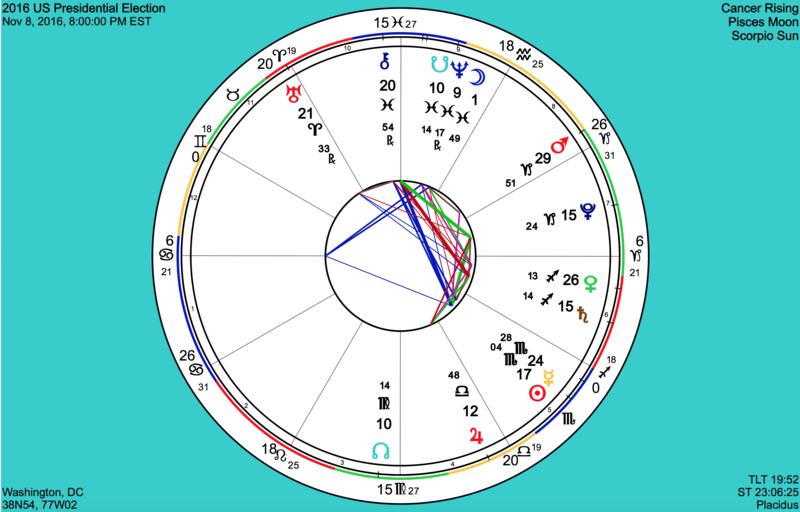 A Mars/Saturn/Pluto conjunction in Leo squares her Scorpio Venus, Ascendant axis and Lunar Nodes. She was never meant to ascend to the presidency. It is a core life lesson for Clinton to accept the position she has achieved (Sec. of State for the US is pretty damned good), that if she reaches for the brass ring, it will be denied to her time and again. This is such a clear natal pattern, it's amazing to me that more astrologers didn't point to it as a key factor in predicting her loss. If the DNC had an astrologer on staff, they would have never nominated Clinton! Granted, Clinton had some pretty decent transits the night of the election. Saturn trine Saturn, Moon trine Sun, Jupiter sextile Mars. To me this speaks to her confidence and probably a good deal of support around her from various powers that be along with her husband and family. But those transits aren't quite as prominent as Trump's, and the Sun's square to Clinton's Mars/Saturn/Pluto basically lit up this issue of frustration — the buck does, and always will, stop here. My opinion as an astrologer is that, for Clinton, her loss is actually a good thing. If she had been elected president, the stress of the job would have made her life miserable. Instead of one big frustrated loss, she'd be fighting frustration every step of the way. And there is real concern, given the transits to her chart, that her health is not in the best of shape, and that the worst thing for her health right now is stress. She needs to learn to relax (North Node in Taurus, 7th) and accept what she has earned. Other karmic lessons will arise for her in time, but for now she must take a back seat and re-examine her life, and after taking some time off, make a plan for putting her past to rest. Some astrologers used an ancient technique called Aries Ingress to predict a win for Clinton. This is a technique that used to be employed to predict the rise and fall of empires and kings. Interestingly, this technique has been shown to be accurate for almost every presidential election since the Civil War (looking back from now), and so it was thought that it would be accurate for this one. However, the ancients were not aware of the outer planets, and what's particularly fascinating and relevant to our times is that the Aries Ingress that was cast for this election only goes to Clinton if you leave out the outer planets. When the outer planets are included, the weight shifts to Trump's favor. In technical terms — the Jupiter conjunction to the Midheaven is outweighed by a Venus/Neptune conjunction to the IC, with Neptune as the IC's ruler. Favorable conjunctions to the IC give the outcome to the challenging party. Shortly after the election, Venus moved from Sagittarius to Capricorn. Venus in Sagittarius represents a hopefulness in a woman (Venus) wise in the laws of political leadership (Sagittarius) taking charge. Shifting to Capricorn, we find ourselves forced to disengage any such hope (Capricorn), turning our focus to what it means to work (Capricorn) for our values (Venus), throwing away the ideal that we'll remain safe with what we had. But we must remember that the delusion that we are safe with business as usual is just as delusional as the belief that we are doomed with Trump. The recent Taurus Full Moon/Supermoon brings this point home. It represents the need to destroy our attachments to external leaders for guidance, or anything else we cling to for false security, and to take the responsibility for living and working by our own higher values. Protest-vandalism and beating up supporters of the opposition completely destroys any moral high ground. 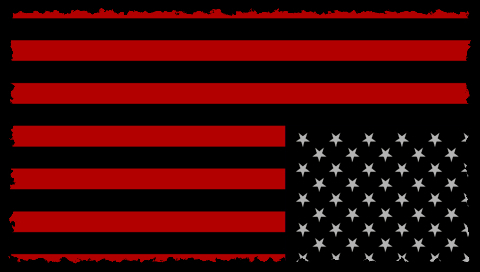 Who you voted for or what polarity of the political spectrum you consider yourself matters far less than your commitment to doing what's right, according to your own higher principles. We will always disagree, and political revolutions will come and go, but so long as we stay true to ourselves and what really matters to us, we cannot lose. Wow!!! great explanations Brian. So the questions that are begging are how does Bernie and Elizabeth Warren look in 4 years. In fact, toss in Trump as well please. I look forward to your analysis my friend. Thanks for the feedback Andy! (and sorry I missed your comment until now) Astrologically, Trump may not last into a second term, I’m more optimistic about a Democratic win, so long as the DNC doesn’t nuke itself again. 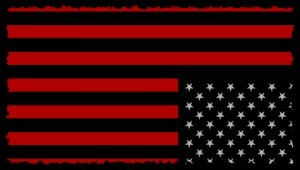 I think the Trump presidency is meant to draw out the unpleasant underbelly of American consciousness, to give us a chance to heal it. This year’s eclipse is likely to bring out a lot of it. It’s a great opportunity to move forward if we can see it and embrace it as such. Thanks for commenting Maria.